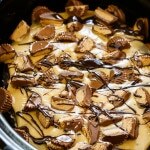 This easy to make Slow Cooker Chocolate Peanut Butter Cake makes a wonderful picnic or potluck dessert. Since it cooks in the crock pot there’s no need to heat up the kitchen. 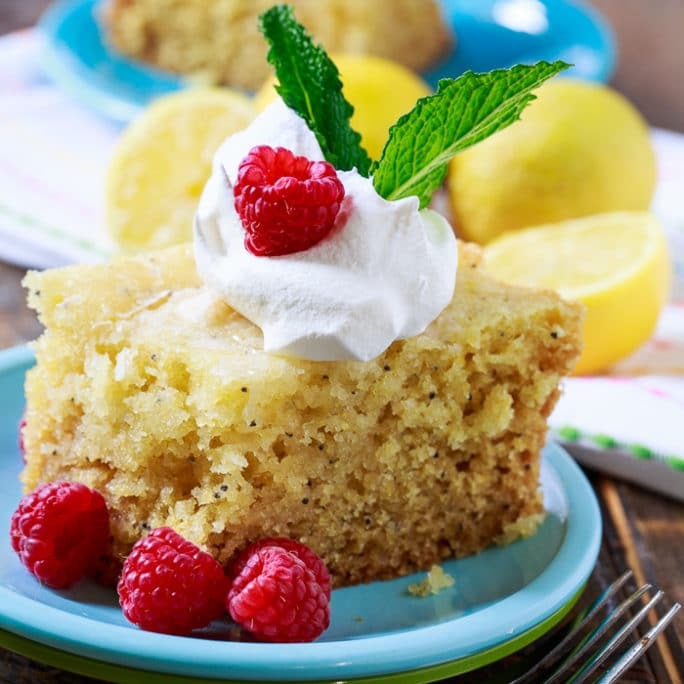 Desserts have become one of my favorite things to make in the slow cooker and they are especially convenient for the hot months of the year.. We’ve already had some scorching hot days in South Carolina. It doesn’t do any good to turn the oven on when the air conditioner is already fighting against 90 degree heat outside. Chocolate and peanut butter is always a winning combination. Especially when there are lots of peanut butter cups involved. The cake batter is made from a box of chocolate cake mix with peanut butter mixed in. The cake only takes about 1 hour and 45 minutes on HIGH in the crock pot. Once the cake is done, it is covered with a peanut butter glaze and mini peanut butter cups, the kind that are individually wrapped. I cut them in half and use a large quantity of them, about 26. Feel free to use as many peanut butter cups as you want. I don’t think there is such a thing as too many peanut butter cups. Watch the short video below to see how to make Slow Cooker Chocolate Peanut Butter Cake. 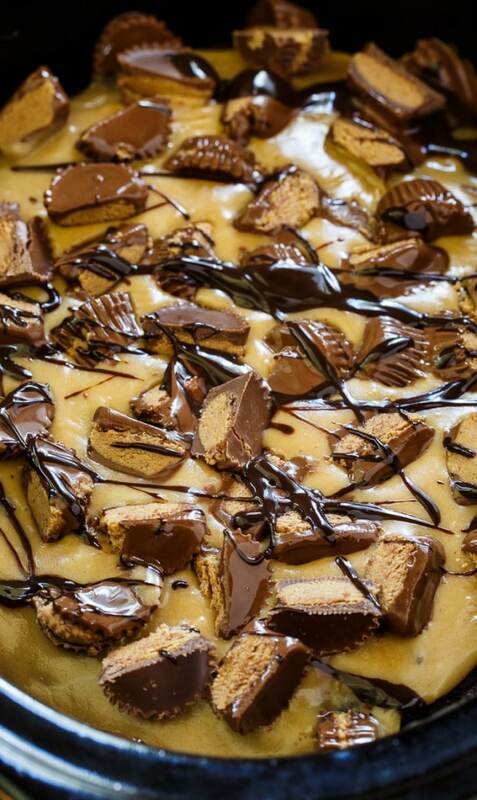 A chocolate and peanut butter flavored cake covered with peanut butter glaze and lots of chopped peanut butter cups. Spray a 6-quart oval slow cooker with cooking spray. Using an electric mixer, beat cake mix, water, eggs, 1/2 cup peanut butter, and butter on low speed for 30 seconds and then on medium speed for 2 minutes. Pour batter into slow cooker. Cover and cook on HIGH for 1 hour 45 minutes to 2 hours. Remove slow cooker insert and place on a wire rack to cool for 15 minutes. Make glaze. Whisk together peanut butter, milk, and powdered sugar in a medium bowl. Spread on top of cake. Sprinkle fudge sauce and peanut butter cups on top. 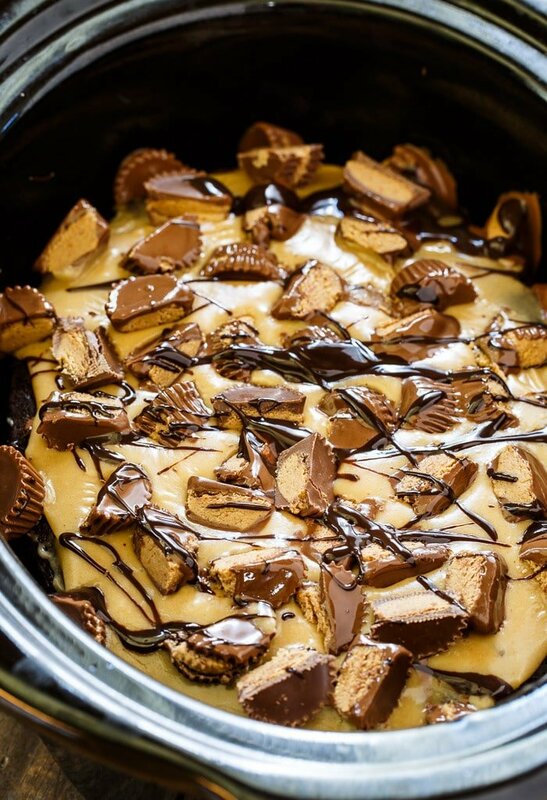 This entry was posted in Cakes, Desserts, Slow Cooker and tagged crockpot recipes, Peanut butter. Bookmark the permalink. Does this have to be refrigerated after it’s cool? We have over half left over . I made this cake today. It was fantastic definitely a hit at my office party. One thing I did not like was the was incredibly liquidy and it ran to the sides of my crockpot. Any suggestions to make it thicker? I am thinking more peanut butter. I only have a 12 oz crock pot. Can I double the recipe and cook for a little longer? I’m thinking of doing this for thanksgiving and we have a rather large turnout. Thanks for asking this question!!! I want to double it as well! has anyone tried it? Can I make this in a 4 quart slow Cooker or will it overflow? I would be worried that the edges would burn before the middle would cook through. Have you tried making this on the low setting instead of high to prevent the edges from getting hard? Making this today! Answering my own question: Yes! I put my crock pot on low for about 4 1/2 hours. Came out PERFECT! Edges were not hard at all. Delicious! I attendrd a chicken stew this week-end and on the dessert table was this amazing looking cake sitting there in a crockpot. It was so tempting looking, I had to spoon out a little on my main plate (bowl). It was a good thing I did because when I went back, there was only one spoonful left!!! I HAD TO get the recipe and of course with all the festivities, I didn’t end up going home with it. So, I got to looking online and whoop-tee-do, here it is! YaY!. I will be making this one in a couple of weeks to take to a lunch. Could you use a marble cake mix instead or is chocolate the idea? I think you could definitely use marble cake mix. Let us know how it turns out! Has anyone tried using parchment paper in their slow cooker so you could “lift” the cake out? Thanks for your help. It’s a soft cake and I found it was more of a spoonable type dessert! Oh so good and you’ll want to leave the house while it’s cooking – the smell will drive you insane waiting that near 2 hours. Good luck Jessica!! I’ve never made a crock pot shepherd’s pie. Might have to give that a try! But I’m with you. If I was in Maine, I’d be looking for any excuse to turn the oven on! Jessica, did you make this cake? Can I use gluten free cake mix still with this recipe? I’ve never used gluten free cake mix in a slow cooker so I am not sure how it would turn out. used a gluten free cake mix and it turned out great. The only thing I changed was I used milk instead of water because the recipe on the box called for it. Can someone tell me why it has to be an OVAL slow cooker?? I only have a round one. I really would love to make this for Thanksgiving. Thanks!! A round crock pot will work just fine Suzanne. Just keep an eye on it because the cooking time might vary. How do you slice a crock pot cake??? An added tip. Use a Crock Pot liner. You can lift the cake out of the pot to cool, before adding toppings. Makes for a lovely visual display, you can slice the cake for serving, and the crock pot stays clean. I made this tonight and it was insanely good! Just made 2 substitutions: instead of peanut butter I used JIF Peanut Butter & Chocolate Whips (because I wanted the PB to Choc ratio to tip slightly in favor of chocolate) and I used frozen Reese’s Minis (the unwrapped ones in a bag) instead of the miniatures (no unwrapping or cutting). I used pretty much the whole bag (except for the 10 I sampled to make sure it was a good bag…LOL!). I ended up using Duncan Hines Swiss Chocolate cake mix because I just prefer the brand, and I couldn’t find the plain chocolate mix. But this was great! And thanks for the tip to check @ 1 hour 30 mins because mine was done then. The cake itself was so moist and tasty…but the glaze and topping just sent it over the top! Thanks for such an easy and yummy recipe! This is the first time I made a cake in the crock pot and thanks to you, it was a perfect experience. Well, except for the 10lbs I’m going to gain enjoying it! LOL! Thanks for those great tips Karen! Wow. This is so tempting! It would definitely be the showstopper at a potluck. And you’re right: there definitely is no such thing as too many peanut butter cups! Oh boy, this is amazing! I’ve never ever used my slow cooker for dessert and wow! 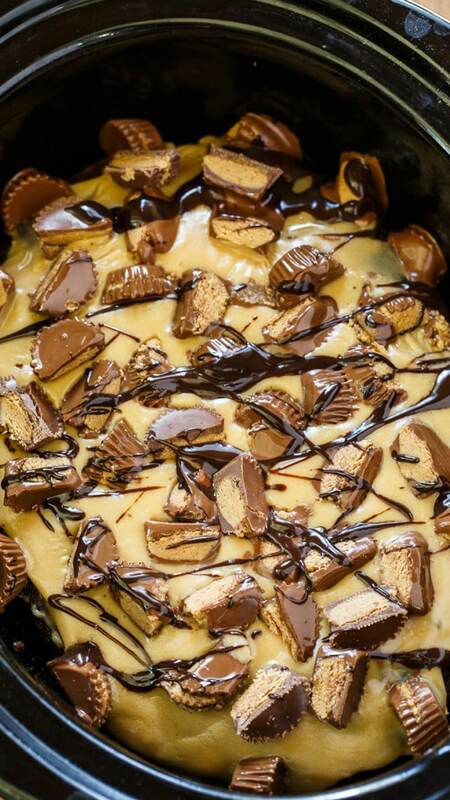 Chocolate and PB is pretty irresistible and it looks so tempting with those peanut butter cups on top! 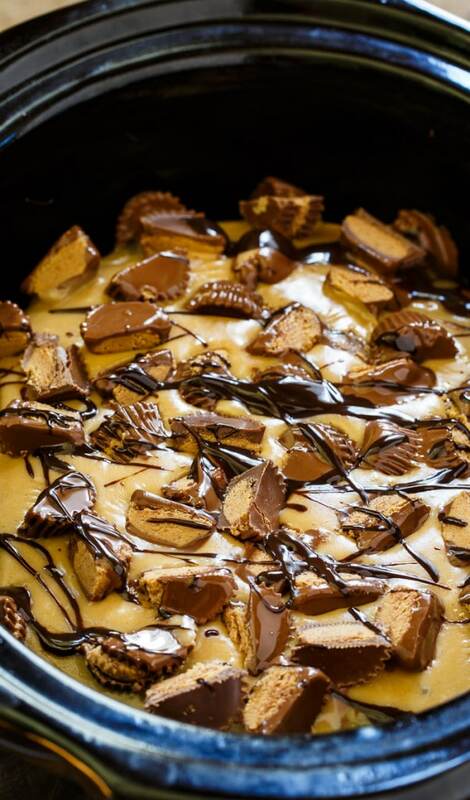 This PB cake looks fabulous- loving the pb cups! OMGeeeeee! This looks crazy delicious, girlfriend! Love how unbelievably easy this is, yet seriously scrumptious! Swooning over all those peanut butter cups! Perfection! Cheers! I really need to use my slow cooker more often to make desserts! And with peanut butter + chocolate??? Best combo ever!